This is just proof that you can learn something new about Linux everyday. So, are you tired of trying to copy and paste information from one source to another by means of pressing Ctrl+C and Ctrl+V? Or better still, by right click -> copy and right click -> paste? Well, there’s a much easier way to do this. No seriously! I just found out about it myself after trying to track down where this bug or accidental copy-n-paste was coming from. You see, normally if you want to copy text or anything else from point A to point B you will be using a copy method that stores that data into the clipboard, holding it until it is replaced by the next copy. With this method, oddly enough, what you already have stored in the clipboard is not altered at all! The method I’m talking about is copy-n-pasting via middle clicking (that scroll wheel on your mouse of course). Here’s how it works. When you select any text (any text at all) in Linux, you may not know it, but it is being stored in a clipboard of it’s own. To access that clipboard to paste from it, all you have to do is middle click! To try this out, select the text here in bold red and press Ctrl-C or right click -> copy. This stores that text in the clipboard that you’re used to. Now, select the text here in bold blue (it doesn’t matter if you leave it selected or not, it works either way). Now, go down to the comments section of this post and middle click in that text area. If you’re in Linux you’ll most likely see that it pastes “bold blue” into the text area (color and font weight won’t appear in that simple text area). Now press Ctrl+V or right click -> paste and you should see that it pastes “bold red” into the comment text area! If you see both items pasted into the text area, then that means you can take advantage of both clipboards as well as a faster method of copying data! It may take a little time to become familiar with it, however, I’ve not been using it long at all and it’s already nearly replaced the old method for me entirely! I recently tried to install Trillian Astra in Ubuntu using Wine 0.9.61 with no luck. I ran into several errors and am still working on straightening them out, but I think this could take quiet a bit of time. After googling for some clues and solutions, I came across a program called CrossOver and decided to give it a trial run. The test cases were Trillian Astra Build 78 and Digsby Build 28. I’ll go a bit into detail on the whole experiment with both test cases and let you know what does and doesn’t work. I’ve been wanting to get Trillian Astra running on my Linux box for a while now (since I was invited to alpha test with them), but have had little to no luck. The issues seem to almost always be related to the rendering of the application more than the functionality of it. I started by downloading the latest version of Trillian Astra and right clicked the installer file and selected the option to ‘Open with “run with CrossOver”‘ (I know that sounds weird, but that’s what the menu option says, lol). During the installation process, I noticed that the graphics and overall rendering of the installer were a bit slow and delayed. Everything rendered in the installer, but you could see images load almost like watching an image load on a web page. I was able to move through the installation steps with errors. Everything seemed to run fine with the installer, however, the installer is the type that is used by several different software developers who just bundle their software with this type of installer. So basically, the installer probably gets used more and therefore debugged more in order to run smoothly than individual applications that are installed with the installer program. 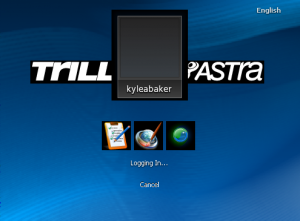 After the installation, Trillian Astra launched the log-in window. First off, the graphics were a bit off and rendering was a bit ugly, but it did work fine. I was able to enter my credentials and successfully log-in to the Astra service. I think the over-all rendering was better when I tried this with Wine as I mentioned earlier. This window just looks terrible in it’s current state! Now that I’ve successfully signed into the Astra service, Trillian went a head and grabbed my contact list and loaded the list into the messenger. This was all good and great, but the window turned out to be in a frozen state. I was unable to move the window, select any elements on the window, etc. It was basically a part of my background image. 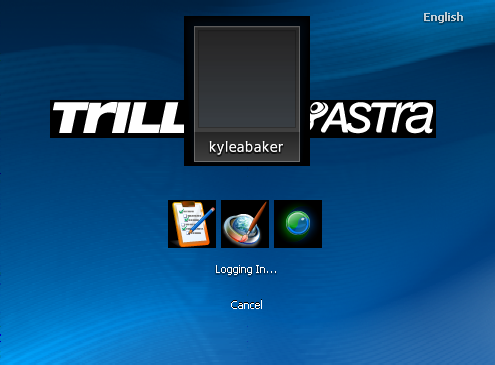 After spending a few minutes trying to do something with Trillian Astra, I gave up and closed the application. I feel like, even though there are more elements that are visible on the contact window in CrossOver than there are in Wine, that it will be easier to debug and fix this application in Wine. It just seems like Wine was at least a little helpful with the errors it returned. That’s as far as I could get with Trillian Astra in CrossOver. If you can get further and have any suggestions then please post them in the comments! This was a rather disappointing installation. I opened the Digsby installation file with CrossOver and moved through the installation process with ease, except for a simple error message that warned about the python.dll library or something. I clicked “OK” and the installation continued and finished successfully. Successfully completing an installation, however, doesn’t guarantee anything will work in Linux. 😛 After the installation I attempted to launch the Digsby application, but I was prompted with two different error prompts that were familiar. Both of these errors were back to back and Digsby did not load at all. This was a mission failed sign. If you get past these error messages and at least get the log-in window then please post your steps in the comments and versions of applications used! I immediately wanted to remove the application since it appeared that there was no hope, so I found the “Windows Applications” menu that CrossOver made for me and navigated to the uninstall menu item in the Digsby folder. I was impressed that the uninstaller seemed to work flawlessly and even opened a web page in my already open Opera browser upon completion. The page that was opened was the typical uninstall survey web page. CrossOver is developed pretty well, however, the applications that you come across and want to install have to be very popular applications, apparently, to work properly. Trillian was much closer to working in CrossOver 6.2.x than Digsby, but neither messenger was in a state worth suggesting to a friend to try. For now, I’m unfortunately forced to stick with a messenger that is decent, but has never been cutting edge at anything. That messenger is of course Pidgin. Pidgin really isn’t a terrible messenger at all, but when you compare it to the messengers that are available for Windows and do a feature comparison…well, it’s just sad to say the least.